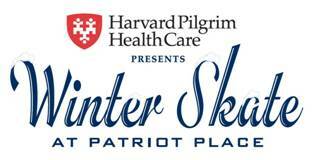 Winter Skate presented by Harvard Pilgrim Health Care, the popular outdoor ice skating venue at Patriot Place, opens November 16. The publicly-accessible ice skating surface provides ideal outdoor entertainment for all ages. The 60-by-140-foot, professionally-maintained ice surface is specifically designed for recreational skating and features an observation deck for non-skaters. The surface is large enough to accommodate recreational skating, hockey and private events. To celebrate the return of Winter Skate, Patriot Place and Harvard Pilgrim will offer FREE skating from Monday, Nov. 19 through Wednesday, Nov. 21 from 4 p.m. to 9 p.m. for anyone who brings a new or gently used coat donation for Cradles to Crayons. After November 21, Winter Skate will continue to collect coat donations as part of the Cradles to Crayons Coat Drive at Patriot Place until Feb. 28, and patrons who donate will receive $2.00 off admission. Winter Skate will offer public skating from 4 to 9 p.m. Mondays through Thursdays, 4 to 11 p.m. on Fridays, 11 a.m. to 11 p.m. on Saturdays and all school holidays, and 11 a.m. to 9 p.m. on Sundays. Winter Skate will be open until late February. Parking is free and concessions and bathrooms are available. Standard skating price is $8 for adults and $6 for children 12 and under and seniors 65 and over. Harvard Pilgrim members receive a $2 off admission by showing their membership card. On-site skate rentals are $4. Full season passes for families are $100. Individual season passes are $75 for adults and $60 for children and seniors. Individual admission and season passes do not include skate rentals. Group rates, private events and hockey rentals are available by calling 508-203-2100 or by e-mail at WinterSkate@Patriot-Place.com. Winter Skate is located at Patriot Place, adjacent to Route 1, near the Renaissance Hotel & Spa. It is steps from Patriot Place’s north marketplace, which offers a wide variety of shopping and dining options, a 14-screen movie theatre and one-of-a-kind attractions like The Hall at Patriot Place presented by Raytheon. For more information, visit http://www.patriot-place.com/winterskate.aspx. Patriot Place is a shopping, dining and entertainment destination located adjacent to Gillette Stadium in Foxborough, Massachusetts. Patriot Place features large and boutique retailers, 17 casual to high-end restaurants and other nightlife venues. Among the highlights of Patriot Place are New England’s first Bass Pro Shops, a state-of-the-art, 14-screen Showcase Cinema De Lux, the 16,000-square-foot CBS Scene Restaurant & Bar, the award-winning Hall at Patriot Place presented by Raytheon and the four-star Renaissance Hotel & Spa at Patriot Place. For more information, visit www.patriot-place.com, follow Patriot Place on Twitter (twitter.com/patriotplace) or like Patriot Place on Facebook (facebook.com/patriotplace). * NCQA’s Private Health Insurance Plan Rankings, 2011-13, HMO/POS. NCQA’s Health Insurance Plan Rankings 2010-11 – Private. U.SNews/NCQA America’s Best Health Insurance Plans 2005-2009 (annual). America’s Best Health Insurance Plans is a trademark of U.SNews & World Report. NCQA The State of Health Care Quality 2004. Harvard Pilgrim Health Care of New England, Harvard Pilgrim’s New Hampshire affiliate, is the top-ranked plan in New Hampshire and the seventh highest-ranked private health plan in America.